This Is Us (NBC, 9 p.m.): Since the resolution of the weirdly morbid “How did Jack Pearson die?” mystery—it was a combination of slow-cooker, family dog, smoke inhalation, and both real and fictional Super Bowls—This Is Us has turned to two more apparent mysteries. The big one got an answer not that long ago: Jack Pearson’s brother, Nicky, is alive, and he’s not doing great. 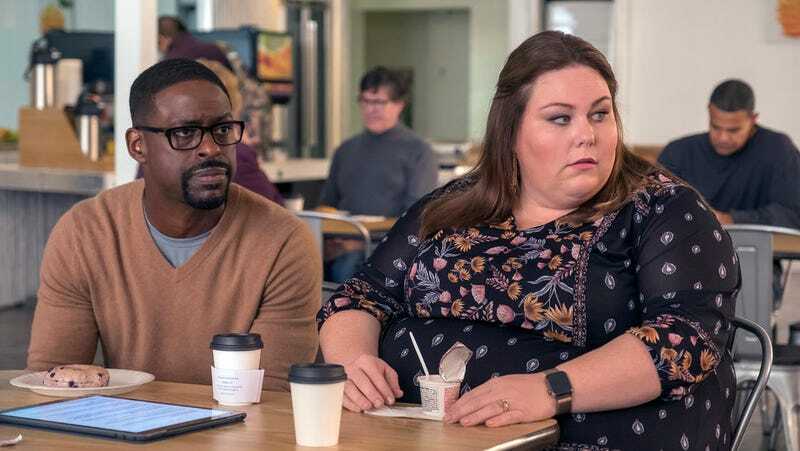 So sure, some of This Is Us’ melodrama is pretty wacky, but it can also be pretty smart about the messiness of people. We’re looking forward to this one, and to Caroline Siede’s recap. Miracle Workers (TBS, 10:30 p.m.): We’re also looking forward to Miracle Workers, “a Heaven-set workplace comedy” from Simon Rich (Man Seeking Woman) in which Steve Buscemi, naturally, plays God. The series centers on a low-level angel named Craig, who is tasked with managing the prayers of humanity; Craig is played by Daniel Radcliffe, who continues his post-Potter streak of doing stuff that’s either kind of weird, a musical, or both. This falls in the “weird” category, but we’re crossing our fingers for some tap-dancing, too.